The second Public Debate in our series was held at Coventry Cathedral on Wednesday 22nd March. If you missed the Public Debate, the following links are here to help you catch up. Watch clips from, or the whole Public Debate, on the Coventry Telegraph Facebook page here. Coventry Cathedral is known all over the world. Designed by architect Sir Basil Spence following the devastating bombing of the city in 1940, it was opened in 1962 and is celebrated as the UK’s favourite 20th century building. Drawing on its history and located next the ruins of the old Cathedral, the building is a worldwide centre of Peace and Reconciliation. Today, as well as fulfilling its key responsibilities as the centre for Christianity for the diocese of Coventry, the Cathedral holds the values of hospitality, diversity and excellence close to its heart. It makes for an ideal venue for our Public Debates, where we hope robust debate will co-exist with Peace and Reconciliation. 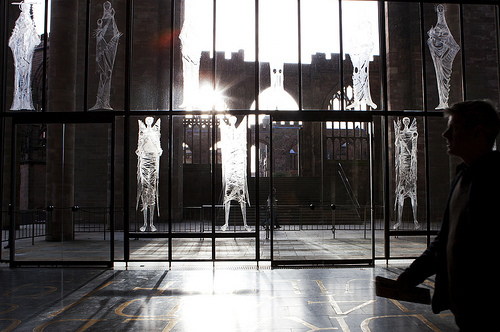 Along with our Partners, we are very grateful for the support we have received from Coventry Cathedral. All our venues provide dramatic backdrops for important Public Debates, together representing the strengths of the West Midlands from industrial heritage to culture and tourism; commerce and conferencing to peace and community.